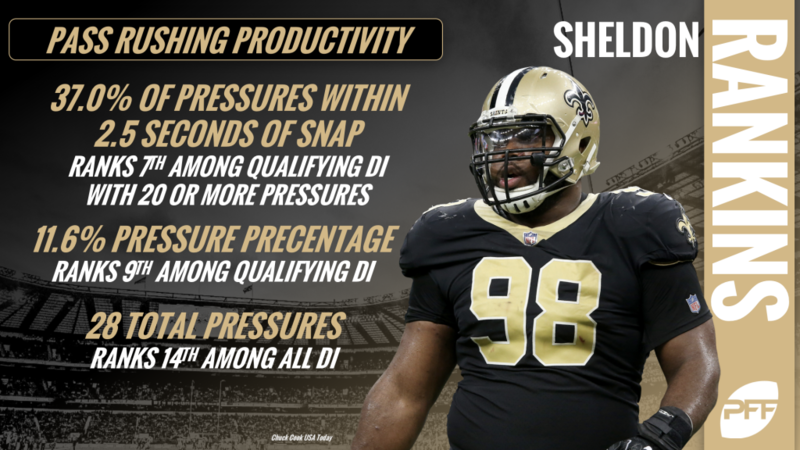 Former Louisville standout Sheldon Rankins earned a 92.6 run-defense grade across his final two years (2014-15) with the Cardinals, ranking third among all defensive interiors with 300-plus run-defense snaps in the two-year span. And while his high-end play against the run propped up his second-ranked 90.8 overall grade, Rankins was far from polished as a pass-rusher at the collegiate level. Now 1,500-plus defensive snaps into his NFL career with the New Orleans Saints, Rankins is blossoming into one of the league’s top pass-rushing defensive interiors. Rankins’ career-high 72.9 pass-rush grade ranks eighth among the 32 at his position with 225-plus pass-rush snaps through Week 10. Against the Cincinnati Bengals on Sunday, Rankins notched four total pressures, including his sack of Andy Dalton that was a product of walking guard Clint Boling deep into the backfield with relative ease. Rankins now has three or more pressures in five of nine games this season. #Saints‘ Sheldon Rankins casually walks Clint Boling, arguably Cincinnati’s best pass-blocking offensive lineman, into the lap of Andy Dalton and records the sack. Rankins’ ability to bull-rush his opposition into submission is becoming an ongoing theme for the 6-foot-2, 305-pounder, as he turned Minnesota Vikings center Pat Elflein into a Boling clone just a few short weeks ago to bring down quarterback Kirk Cousins for a sack. That man has a family, @RankinsSheldon. Now, Rankins ranks just tied for 14th in total pressures (28) among defensive interiors this season, but his 11.6 pressure percentage ranks tied for ninth among qualifiers. He’s also made a knack for creating pressure early in the down, as 37.0% of his pressures have been recorded within 2.5 seconds of the snap, which ranks seventh among the 26 defensive interiors with at least 20 pressures in 2018. While his run defense has fallen off a bit this season compared to his college days, Rankins’ improvement as a pass-rusher is paramount if he’s going to make a name for himself in this league. A horse we at PFF have beat to death as of late, stopping the run isn’t nearly as valuable as rushing the passer, and Rankins is going from trivial to formidable in the more valuable area of the two in a hurry.